Sardine rocks! In Outer Space! The brave little intergalactic explorer and her family sidekicks in SARDINE IN OUTER SPACE – Captain Yellow Shoulder, her uncle; and Little Louie, her cousin – are the featured characters in the series of collected comic books from the French team of writer Emmanuel Guilbert and illustrator Joann Sfar. 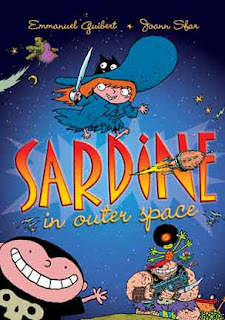 Sardine is a spunky girl with big ideas in her head (and a big blue hat and a flying black cat) and her band of friendly space pirates travel the universe in search of adventure aboard their pirate space ship called The Huckleberry. And they encounter adventure from every directions – saving alien life forms left and right from near disaster, usually brought on by the villains of the series – Supermuscleman (chief dictator of the universe) and his brainy mad scientist sidekick, Doc Krok. Told in short vignettes, SARDINE IN OUTER SPACE has been published in five collected editions from First Second Publishing. Guilbert is most effective as a storyteller as he warps his vision of the worlds encountered by the crew, as seen through the eyes of his young protagonist. Sardine is smart, and strong, but she is also guided by a moral compass and outrage at creatures who have fallen victim to Supermuscleman and his cronies. Revenge is what fuels most of the Sardine stories and yet, the revenge is tempered with the sense that there are lessons to be learned in life, such as not trying to take over the universe with rules such as "no talking or laughing." Guilbert spins these tales through the eyes of a child. We see Sardine's uncle as a strong and kindly protector. Little Louie gets them in all sorts of trouble, as he clearly needs the excitement of potential chaos in order to have a good day. Supermuscleman and Doc Krok are dangerous, but only in a humorous way. There is no way those two bumbling fools could control the universe and Sardine is not afraid to let them know that their rules will never apply to her and her band of space pirates. Meanwhile, Sardine and her crew regularly return home to Grandmother's house for a good home cooked meal and some loving from the family matriarch. Oh, and pirates? That's just another way of saying that Sardine and company are always on the prowl for adventure. They are not the throat-cutting, gold-stealing, ship-stealing pirates of the old days on the sea. In space, apparently, viciousness is tempered with humor. In a story in which the group finds what they think is a dead body, the reader is told not to worry – nothing violent has happened and all will be resolved by the end of the adventure. And it is. Guilbert pokes fun at many things in our own world, including education. In the story called "In the Land of the Bully'ems," Sardine and Little Louie buy a video game called No-Child-Left-Behind-School-II (after which their uncle asks, "Isn't that game a little violent?") and the kids enter a virtual world of a schoolhouse in which they are chased by a truant officer, come face to face with an authoritarian teacher, and observe a classroom of dull and uninterested students. Needless to say, Sardine and Little Louie are happy to leave that place behind and return to their own spaceship. These books also come with a message for all readers right on the inside cover. In a speech bubble, Captain Yellow Shoulder alerts us that, "NO GROWN-UP ALLOWED! (unless they're space pirates or space adventurers)." The artwork of SARDINE IN OUTER SPACE works on many levels. The manic craziness of the colors and characters is a nice tandem to the strange stories that unfold in the books, and the characters of Sardine and others are distinctive in many ways. For example, Uncle Yellow Shoulder is all muscle and brawn and scars, and yet, the wide smile never seems to leave his face while Doc Krok looks like the result of some experiment on an octopus, with huge fingers and a massive oval orange head and small beady eyes. The illustrations are jam-packed with many strange creatures and details in the background. Sfar (who is listed as the main illustrator for books 1-4 but then is left off the credits on book 5, but her style remains completely intact) also uses a black background for many of the frames and rich colors for everything else, giving the reader a real sense of objects and aliens jumping off the page. In many ways, the illustrations are as interesting as the stories in the Sardine series. Guilbert and Sfar have created their own universe here and then tweaked it with the laws of our own. They play with the reader's expectations. For creative writing, students could do the same. For example, students could consider themselves in the role of Planet Creator and come up with a list of ways that their new planet is unique. They could create a map of this new world and then invent either a character who lives there or a traveler discovering this place. The conflict between our perceptions of what a world (like Earth) should be like and what this new place is really like provides a potentially interesting setting and plot device for a short story or a comic book. This book is very appropriate for younger readers in the mid- to upper-elementary grades (my 8- and 10-year-old sons kept hiding my books from me as I was trying to write my review and that is always a good sign in our house that there is high interest in a book). There is nothing inappropriate in the stories and no profanity at all. I would highly recommend this book for any classroom setting.